Dr. Barry Asmus speaks, testifies, writes and consults on political and business issues facing America. Dr. Asmus likes to explain the economic concepts needed to navigate the evolving network economy to worldwide firms like Compaq, Hewlett Packard, IBM and a host of other audiences. Based on durable free market economic principles, his presentations apply the current issues of the information economy to help decision-makers formulate informed and effective choices in a global, e-commerce world. Barry’s latest book, co-authored with Kent DelHousaye, is titled Bulls Don’t Blush, Demographics Don’t Lie. He is also the author of Apollo: An Outer Space Economic Adventure, ClintonCare: Putting Government in Charge of Your Health and The Best Is Yet to Come. Barry receives standing ovations and repeat invitations because he customizes every presentation. Unique and fresh, his speech presents an optimistic and thrilling future for America. Dr. Barry Asmus has been named by USA Today as one of the five most requested speakers in the United States. As a Senior Economist for the prestigious National Center for Policy Analysis, Dr. Asmus does more than just speak on policies, he is actively involved with their implementation. With over 25 years experience on the speaking platform, Dr. Asmus presents a powerful picture of America’s future, both here and abroad. 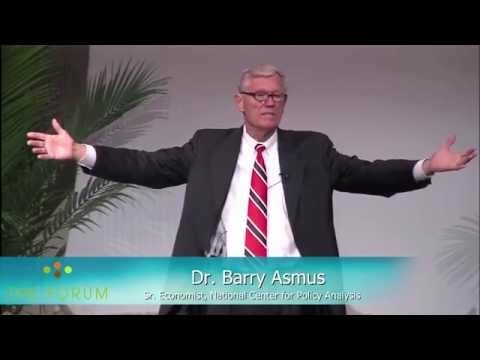 Whether addressing 30 world bankers at the home of Harvard’s President, 3,000 farmers in Des Moines or 7,000 members of the Million Dollar Round Table at Radio City Music Hall, Dr. Barry Asmus presents his commentary laced with humor, enthusiasm and solid business practices. Based on durable free market economic principles, his presentations analyze the current issues of the digital economy to help decision-makers formulate informed and effective choices in a global, e-commerce world. He has testified before the House Ways and Means Committee regarding our income tax system; was a featured speaker in a privatizing Social Security conference for Western European leaders; and has addressed the faculty for the Young Presidents Organization in Cape Town, South Africa. His appearance at the Forbes Chateau de Balleroy in France with former Czech Prime Minister Vaclav Klaus, members of British Parliament and other Western European leaders focused on the importance of public policy decision in Europe and how they might integrate with the global economy. 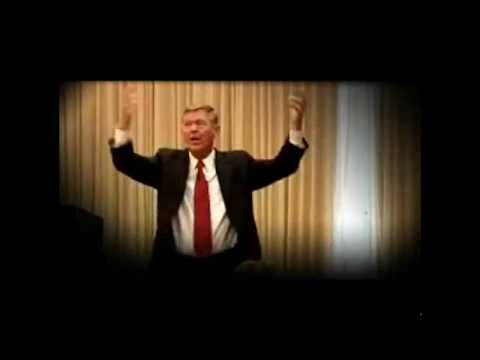 Dr. Barry Asmus is the author of nine books. His latest is titled Bulls Don’t Blush, Bears Don’t Die, it provides an insightful summary of today’s economy, the problems facing it and proposed solutions to these problems. Another book of note, Crossroads: The Great American Experiment, was nominated for an H.L. Menken award and has been used in hundreds of University classrooms for international trade and comparative economies. As a Professor of Economics, he was twice voted University Professor of the Year and was honored with the Freedom Foundation Award at Valley Forge for Private Enterprise Education. A major highlight of Dr. Asmus’s career was the invitation he received to deliver a “Tribute to America” speech at the rededication of the Statute of Liberty by former chairman of the Board for Chrysler, Lee Iacocca. His client list reads like a who’s who in corporate America. He has presented to American Express, Microsoft, ATT, Wells Fargo Bank, McDonald’s, State Farm Insurance, Coca Cola, Fidelity Investments, AIG, Cardinal Health and hundreds of Associations. Barry Asmus’s ability to reach a diverse audience is one of his strongest attributes. As a Senior Economist with the National Center for Policy Analysis, Dr. Asmus has argued for removing laws that restrict the development of domestic energy supplies. By 2020, Asmus estimates that America will consume 125 quads of energy, a 25 percent shortfall from the current supply. France doubled its energy independence by building 57 nuclear power reactors in the last 30 years. The U.S. should do the same. By drilling in Alaska, in America's Outer Continental Shelf, in the Gulf of Mexico, and in states that have huge deposits of shale and coal our dependence on foreign oil would fall dramatically, as would energy prices. Both wind and solar energy will be helpful in the long term, but they are only intermittent sources of future power. Do we want more oil, gas, and electricity or more regulation, taxes, and dependence? The choice is ours. How much would you buy if you went shopping with someone else's credit card? Yet, this is how today's health care system works. We are spending everyone’s money except our own. Is it sustainable? No. Can we do something about it? Yes. Health Savings Accounts create the necessary incentives for a competitive health care system. A high deductible catastrophic insurance plan would cover the high costs, while an individual health saving account would cover all the smaller charges. Reforming Medicare and Medicaid reimbursements would also allow hospitals to overcome the governmental mandate of free health care, currently at $30 billion annually. Tort reform and limitations on medical liability are necessary to slow down the practice of defensive medicine. Widespread use of electronic medical record keeping is imperative for cost and quality control. Dr. Asmus' presentation offers real world solutions to run-away health care costs.